Turn any flat surface into a large interactive display with this widescreen, 2,600-lumen ultra-short-throw projector. 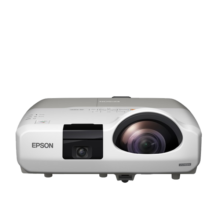 With the world’s shortest throw, fully-integrated interactive projector from Epson, brainstorming and discussions in classrooms and office presentations will take on a different perspective. The world’s shortest-throw fully-integrated projector* eliminates many common problems of interactive systems. 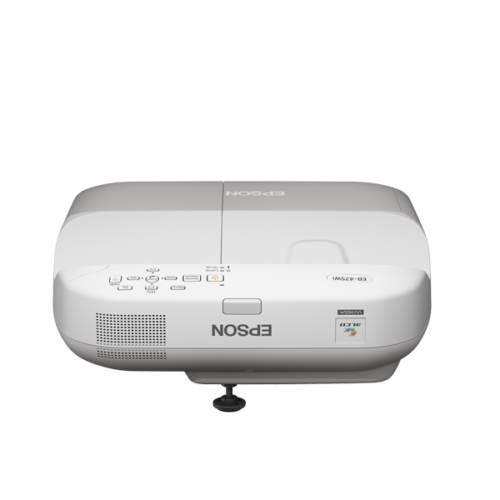 Mounted as close as 7cm (2.8 inches) from the wall, this compact projector series can project extra-large images without shadow interference and obstruction, making information sharing smoother. 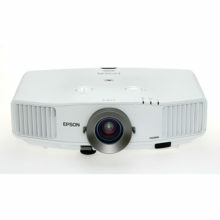 *The Epson EB-475Wi and EB-485Wi projectors have the world’s shortest throw distance compared to other integrated interactive projector models, as of January 2012. Only EB-485Wi/475Wi/470i are fully integrated with interactive feature. Even when you stand directly in front of the screen, light rarely reaches your face. This makes presentations more pleasant and stress free, allowing you to fully concentrate on delivering your lessons or reports. Epson’s latest projector series operates on a plug and-play mode for easy set-up. Drivers are not needed*, so you don’t have to spend more time setting up your PC before using the projector. Simply connect your PC and start using the interactive functions. For some projectors, calibration is required during the first setup and subsequent changes in image size. 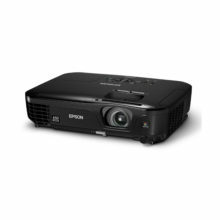 Now, Epson’s latest projector series has an auto calibration features that will calibrate the projector automatically by just a click of a button within a few seconds. * Applies to Windows and Linux (Ubuntu) only. Two differently coloured interactive pens are provided with multi-use and greater interactivity in mind. They work like a computer mouse and are designed to facilitate an easy grip for children and adults. The higher response speed and accuracy make drawing as instant and responsive as using a pen on a whiteboard. With most of the weight near the tip, it feels similar to writing with a real pen and they can even move the projected sensors without them touching the surface of the board or wall. 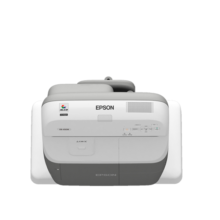 With this original function by Epson, you can electronically annotate your document using the pen to highlight key points and draw on the projection screen, creating compelling presentations. The bundled Easy Interactive Tool software lets you save your annotations as PDF or JPEG files and allows control for Epson DC11 and DC06 document cameras. With it’s ultra-short throw advantage, you can now consider retail display projection for higher visibility of any window display products. Take advantage of underutilised classroom space or turn any existing board into an interactive projection wall. Mounted on a wall or set on a desktop, this projector series works on any surface – a flat wall, an existing whiteboard or a chalkboard. Equipped with the new Pointing Down Mode, these models allow you to project onto a table, expanding the possibilities for new interactive lessons in the classroom or office. Now, you can connect the projector wirelessly to your LAN in addition to a direct PC connection. This eliminates messy cabling since the audio feed can be transmitted wirelessly to the projector, making set-up easy for beginners and experienced alike. For more hassle-free presentations, the multi-screen display feature allows you to show four different images at the same time or one single image across the breadth of four screens. This can be controlled via a single computer so there is no need to switch between computers when giving a presentation that uses even multiple applications. Designed to better assist the way you teach or present, this series allows control, image and sound transmission from a computer to the projector via a USB cable, eliminating the need for complicated cabling. Since this projector series operates on both Mac and Windows operating systems, you can choose your preferred presentation platform. With EasyMP Monitor, Epson’s proprietary network monitoring software, you can easily monitor all your projectors and keep them running efficiently, even across the largest networks. Configure projectors remotely and programme email alerts for pre-defined critical indicators such as non-functioning devices or overheating lamps. Administrator can also do message broadcasting to all projectors for emergency message or announcements. Adaptability to everything from PCs and microphones to HDMI and LAN cables means that this projector series is compatible with any setting. Its advanced connectivity features make it simple to incorporate additional technology as you upgrade your system. A powerful 16W built-in speaker, along with a microphone input, eliminates the need to connect to an external speaker. Its high-quality output is clear enough to fill even large rooms – making this projector your perfect partner in presentations. The interactive function of the projectors does not require any driver installation or PC connection. The instant annotation tool enables users to activate the interactive functions without connecting to a PC or laptop. Users can annotate images projected from the document camera (ELPDC06/ELPDC11), flash drive and even videos from a DVD player without any PC source connected. Screen adjustment can be complicated with the ultra-short throw projector. To make this process simple, three intuitive dials are clearly labeled to indicate which one to use for each setting. For fine adjustment, all six axes can be individually corrected using the Epson setting plate. With the new vertical height adjustment feature, you can slide the image vertically without changing the image size.